A lovely classic, but also a classic put-down in its way. 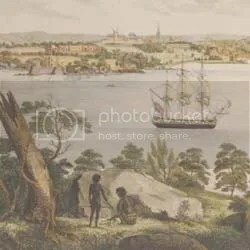 This database contains details of Irish convicts who were transported to New South Wales in the period 1791 – 1831. It is very good. Whitfield, Jacob Ship: Isabella I  1820 Tyrone Co Sentence: Life Occupation: Ploughman. I doubt he would have made much use of the family crest I showed you yesterday. What a different Sydney he arrived in! We just need to get back to the international human rights standards that are a considerable achievement of humankind. It’s important to reinforce the true values of our societies. If we compromise those then we have done a terrible disservice and made us all less secure in the longer term, so that the undermining of rule of law and of no torture and no detaining people endlessly without trial, without any reference to their families etcetera…I mean, (look) how far these matters have gone. So we need to reassert the standards. And here is that teacher in a Brisbane Islamic school that I said last Sunday deserves a medal. Read the wonderful poem “From the Republic of Conscience”.